A study released by the American Heart Association shows that women who ate at least three servings of blueberries and strawberries per week reduce their risk of a heart attack by 30%. Flavonoids are organic chemicals that are found in plants. These nutrients have beneficial effects on the human body. Chemicals that are found naturally in plants are called phytochemicals. 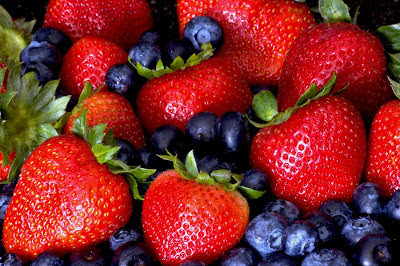 Berries, tea, apples, soy food, and red wine are some of the food that are rich in flavonoids. The Zutphen Elderly Study, the Seven Countries Study and a cohort study in Finland show that consuming flavonoid has an inverse effect with coronary disease. Results of the study show that people who consumed about five to six cups of flavonoid-rich tea per day had a lower death rate from heart disease than people with a low intake of flavonoids. The link between flavonoids and coronary heart disease like atherosclerosis (the accumulation of fat deposits in the arteries), may be due to the antioxidant properties of flavonoids. Flavonoids also have been shown to inhibit the aggregation and adhesion of platelets in blood, which may be another way they lower the risk of heart disease. Soy foods which contains isoflavones (a major flavonoid category) have been reported to lower plasma cholesterol and also to have effects similar to estrogen.